Why I Say “Bless You” When My Non-Verbal Son Sneezes – Hi Blog! I'm Dad. A response came from my daughter, who was seven at the time and sitting at her desk just outside the kitchen door. She didn’t look up but simply spoke matter-of-factly. That wasn’t me. That was Lucas. Confused, I looked at her. I genuinely didn’t understand why she told me that. Did she think she had a monopoly on house blessings? Then why did you say God Bless You? He doesn’t know “God Bless You”. I paused for a moment to process the question. It wasn’t said in a way to be dismissive of his disabilities or present him as less of a person. It was asked in the way that a then-seven year old asks in order to better navigate the world ahead. She genuinely wanted to know why I would be offering a social nicety to a boy who doesn’t outwardly understand it. Lucas may be able to recognize some words and directions but, as a non-verbal five year old, the concept of “bless you” isn’t one of them. Hell, as a verbal adult, I don’t fully understand it. I think it’s something about people in olden times being afraid that sneezes meant your soul was escaping your body. It sound ridiculous when you really analyze it but it’s something we all just do. Despite never thinking about my reasons for blessing my son’s sneezes before, I was able to offer her an automatic explanation that made sense. In fact, it all came as news to me since I had never given it much thought. As it came out of my mouth, I listened like someone else was explaining it. I could see the wheels turning beneath her giant curly hair. The look on her face told me that she was processing a totally new concept. Olivia nodded and I could tell that my words affected her. To be honest, they affected me. 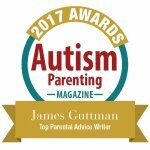 As the parent of a child with autism, I’m constantly doing things that might seem strange to an outside observer. I don’t always get angry with Lucas when he can’t handle something. Other times, I’ll hold him to a standard that people think he’s incapable of because I know he’s not. Then there are little things as simple as acknowledging a sneeze, even though it may appear that I’m simply saying “bless you” into empty air. But I’m not. I know that inside of him is the capacity to understand everything I say. He might not understand it right now. He might not understand it tomorrow. If I do it enough, though, and say it enough, one day, he will – even if he’s not able to show it. I know that this is true. Since that day, his sister has known it too. Now, she says “God Bless You” when he sneezes also. It may never happen, but the day that he finally says back “thank you”, we’ll be ready. Love this article! Our 3 year old son has been non verbal until fairly recently and we’ve always said it to him. Now every time he sneezes he shouts ‘bess oo’!! That is awesome, Lisa! Thank you so much for that. Stories like yours really make me smile.